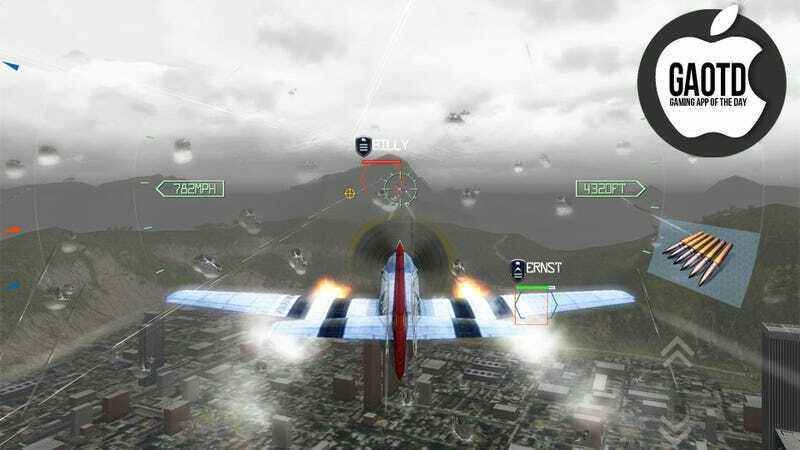 We've mentioned Namco Bandai's Sky Gamblers: Air Supremacy briefly during the launch of the new iPad, but we never got around to featuring it as a Gaming App of the Day. I don't know about everyone else, but for me this was because I was too busy playing Sky Gamblers: Air Supremacy. This is console-quality air combat in portable form offering more options and gameplay for $4.99 than most console games in the genre deliver for $60. It's got a lengthy single-player story mode, dogfight missions, and five different online multiplayer modes (for up to 10 players thanks to a recent update). At any given moment I can pick up my iPhone 4s or iPad 3 (that's what I'm calling it, dammit) and within seconds I am engaged with players from across the country, dodging their missiles while taking them down with my trusty P51's machine guns. There are dozens of planes to unlock, with more coming via regular updates. Each handles like a dream no matter which of the four control modes you select, from full-on simulator to the more casual control pad options. And the graphics? Well the graphics are certainly impressive, especially on Apple's newest devices, where it's optimized with 4x anisotropic filtering, refractive raindrops, radial blur, and other buzz-words that mean it looks pretty. Sky Gamblers: Air Supremacy has gotten plenty of praise for the way it looks, but it's the way it plays that's the real triumph here. It's like a portal Ace Combat game, only without all the disappointment.